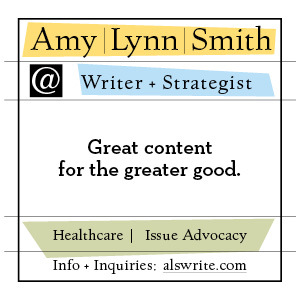 This guest post comes from Sean McElwee — a research associate at Demos and an excellent follow on Twitter. Find out more about Sean, his work and what his research into voting uncovered about Michigan by checking out his Eclectablog posts on how to make America more progressive and Michigan’s somewhat impressive voter turnout. In my latest Salon piece, I explore an increasingly important divide on the right: between business conservatives primarily concerned with their bottom lines and ideological conservatives (like the Koch Brothers) driven by an anti-government zeal. Normally, these groups align well, but in the case of the Medicaid expansion, they did not. Business conservatives (in the study, represented by Chambers of Commerce) liked the expansion, and did not want states to leave money on the table. The Koch network, including the American Legislative Exchange Council, the State Policy Network and Americans for Prosperity staunchly opposed the Medicaid expansion. Where the former was more powerful, the expansion passed, where the latter were, the expansion failed (all other factors being equal). Here, I’d like to quickly note three key findings from the work of Skocpol and Hertel-Fernandez regarding the Koch network, based on slides they recently presented at a Scholars Strategy Network event. 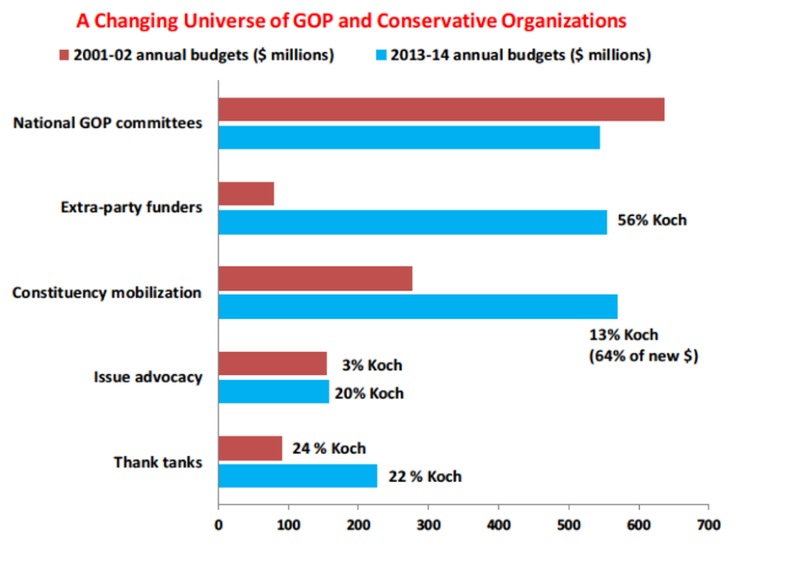 The chart below shows the dramatic rise of the Koch brothers as compared to the Republican Party. 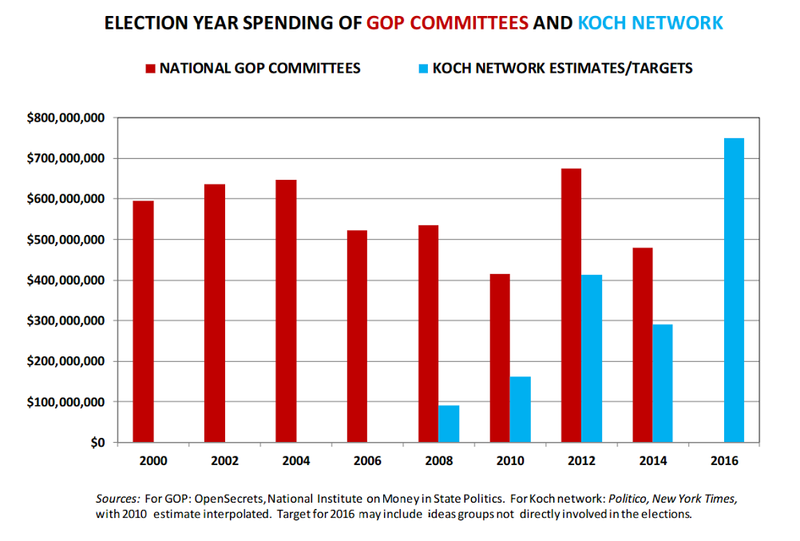 If the Kochs meet their targets in 2016, they will likely spend as much, and possibly even more than the Republican Party on the elections. The chart below shows that as the National GOP Committees have become weaker, extra-party funders and constituency mobilization have increased dramatically. That’s worrying, because much political science research suggests parties are moderating influences on politics. As parties (and average Americans) become weaker and donors become stronger, we can expect our politics to even more sharply diverge from the preferences of average Americans (and be pulled to the right). 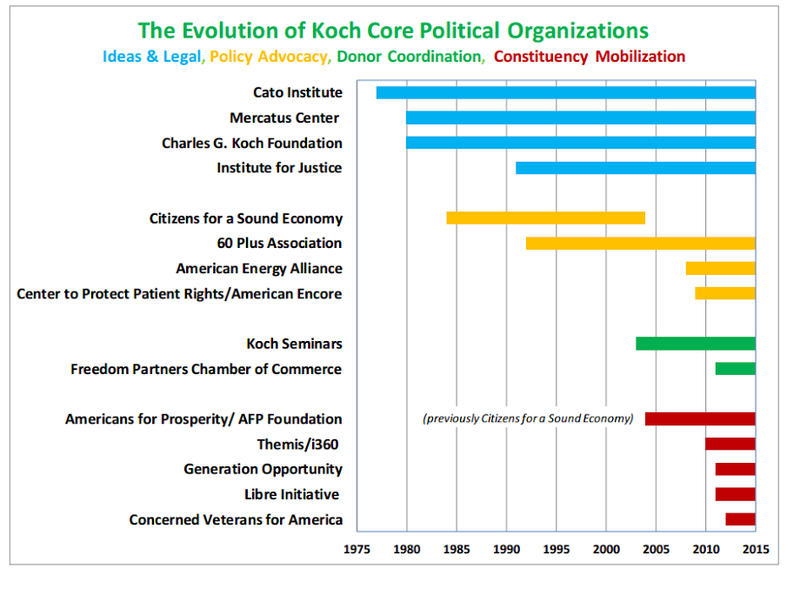 From the mid-2000s, the Koch network turned to mobilizing activists and contacting voters for elections and policy battles. 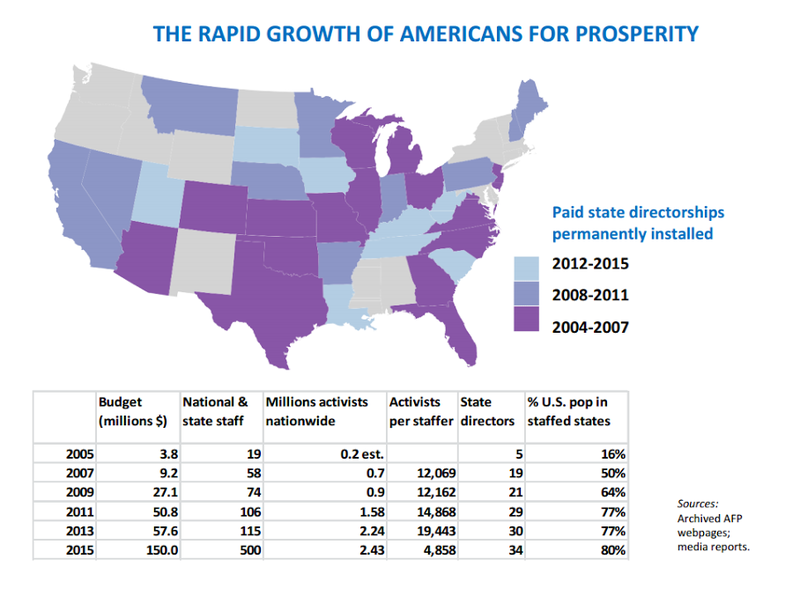 The key move was building a centrally directed nationwide federation, Americans for Prosperity – which had paid directors and staff in 15 states by 2007, and expanded by 2015 to 34 states encompassing 80% of the U.S. population. Themis/i360 was launched to collect and analyze real-time voter data; and specialized organizations manage outreach to key constituencies such as young people and military veterans. The most important of these is the Libre Initiative, working to attract Hispanic support in electoral swing states. The projected budget for Americans for Prosperity would be unprecedented for a private political group in a midterm, and would likely rival even the spending of the Republican and Democratic parties’ congressional campaign arms… AFP’s $125 million projected 2014 budget alone would also exceed the total 2012 fundraising hauls of the Democratic Congressional Campaign Committee, National Republican Congressional Committee, Democratic Senatorial Campaign Committee or the National Republican Senatorial Committee. 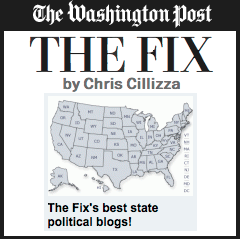 Progressives have failed to create a similar state level infrastructure, though not for lack of trying. 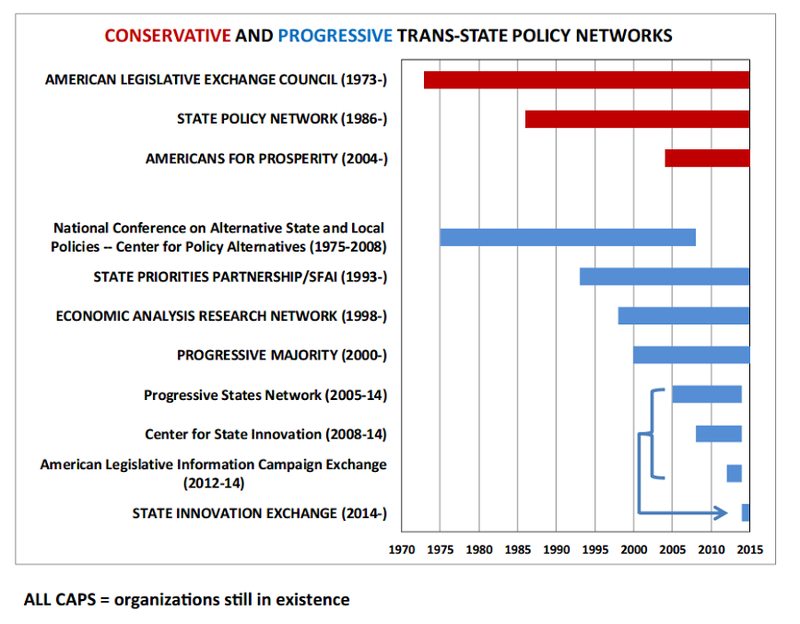 As the chart below shows, there have been numerous aborted attempts to create a cross-state progressive network. Skocpol and Hertel-Fernandez highlight three key differences: conservative groups are better funded, can better manage competing priorities and push policies that increase political clout (by hobbling unions, for instance). The two recently wrote a detailed Democracy essay featuring interviews with progressive and conservatives working at the state level. It’s worth noting that SiX, dubbed an “ALEC-killer” is hoping to eventually reach a budget of $10 million a year, which would be one-fifteenth of the annual budget for AFP, which had a budget of $150 million in 2015. Progressive efforts must also focus on structural changes: automatic voter registration to ensure everyone can vote and public financing to make sure everyone’s voice is heard. But strengthening government capacity is also important: studies show that non-professionalized legislatures (professional legislatures have higher pay, employ paid staff for legislators and representatives typically don’t have other jobs in addition to legislating) are more prone to pushing through ALEC bills and do a worse job representing the preferences of their constituents. It’s easy to criticize the Kochs (I’ve done so many times! ), but it’s also worth learning from them.